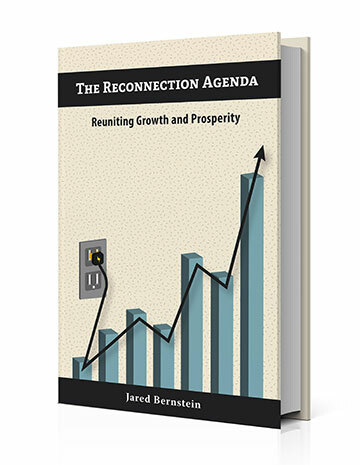 Jared Bernstein | On the Economy | "Wisdom is respected, hatred is rejected." In a hearing last week, an exchange between Rep. Katie Porter (D-CA) and JPMorgan’s CEO Jamie Dimon caught my eye. Dimon was touting the bank’s new minimum wage of $16.50, increasing to $18 in high-cost areas, for entry level workers. That’s a decent minimum wage, above the $15 that most progressive plans call for (and those proposals typically include a phase-in of numerous years). According to recent EPI analysis, $16.50 is well north of the national 40th percentile wage of just under $15. It is, however, easy to write “correct a structural imbalance” and much, much harder to do so. This new piece by the Roosevelt Institute offers a resonant diagnosis and prescription to this structural power imbalance, but it took a long time to get here. Moreover, our uniquely toxic money-in-politics problem has allowed the narrow group of big winners to worm their way into entrenched power. It will take time, energy, resources, and commitment to reduce their hold. Derigging the economy is the right goal, but it’s one that’s going to take awhile and, relative to many of my fellow progressives, I’m less certain of the political support for this project. That doesn’t make it any less urgent, but it does raise the bar we must clear. Which brings me to a more immediate solution to the problem Porter raised. It comes in the form of a bill introduced last week by four D senators (Brown, Bennet, Durbin, and Wyden), and given the forces swirling around that I just described, it’s a proposal that hits a sweet spot, accomplishing ambitious, long-held progressive goals in a way that is inviting to more moderate Democrats (at this moment, 46 Senate Democrats have signed on). I’m talking about the Working Families Tax Relief Act (WFTRA), a proposal designed to raise the incomes of low-income and working-class households, with and without kids, by expanding two existing tax credits: the Earned Income and Child tax credits (EITC and CTC). For details, see here, but according to analysis by colleagues of mine at the Center on Budget and Policy Priorities (CBPP), a group with deep expertise on these types of tax credits, the bill would raise the incomes of 46 million low and moderate-income households, more than a third of American households. While it wouldn’t close the whole gap shown in Porter’s tweet, it would close part of it. In contrast to the regressively targeted Trump tax cuts, this bill would lift 29 million people, including 11 million kids, above or closer to the poverty line, lowering the child poverty rate from 15 percent to 11 percent. Its CTC changes would raise the incomes of families with over 40 million children, lifting 1.3 million children out of deep poverty (income below half the poverty line, or about $10,000 for a single parent with two kids), and thereby reducing the deep child poverty rate from 5 percent to 3 percent. To put all these percentages in a more concrete context, consider some of CBPPs examples of the bill’s impact of the incomes of some families playing by the rules, doing their best to makes ends meet in corners of our labor market where, even at low unemployment, wages are just too low. Consider a mom with two kids, 4 and 7, who makes $20,000 as a home health aide. WFTRA would raise her CTC by $2,210 and her EITC by about $1,460, for a combined gain of about $3,670. For a married couple where one spouse makes a more moderate income of $45,000 and the other cares for their two young children, their EITC/CTC goes up by $3,460. The WFTRA accomplishes these goals mostly by tweaking the parameters and eligibility standards of the two existing credits it expands (importantly, given how much families with very young kids need the money, it adds an addition credit for families with kids under 6). The fact that it builds off successful, existing programs that maintain some bipartisan support is a strong selling point and probably responsible for all those Senate sponsors. I reiterate that when it comes to pushing back on decades of inequality and much weakened bargaining power of lower paid workers, it’s critical to think big and outside the box. Progressives have welcomed calls for universal coverage, Sen. Warren’s wealth tax, and Sen. Bennet and Brown’s proposal for a child allowance of the type that exists in most other social democracies. But WFTRA adds real and much needed progressivity to our tax code, and it does so in a way that gets a sign-on from both Senator Elizabeth Warren, a highly progressive Democrat from Massachusetts, and Senator Manchin, a moderate from West Virginia. Still, the structure of the WFTRA is insufficient for some on the left. Matt Bruenig objects to the phasing in of benefits with earnings, as this approach provides more help to higher earning families. Fair point, but one that undervalues WFTRA’s proposed change to the CTC which goes the other way: it’s fully refundable even to families with no earnings. In fact, families with incomes so low that they get nothing under the current CTC would come away with a few thousand under WFTRA ($6,000 if they had 2 kids under 6 and no earnings), giving it characteristics of the more progressive child allowance. Bruenig also implicitly assumes something about which I’m skeptical: that there’s political support for delinking the highly effective, bipartisan-supported EITC, from work. In sum, the pursuit of economic justice requires us to work on various tracts. The overarching goal of derigging the economy and righting structural imbalances require new rules of the road, trade agreements forged by workers, not just investors, big changes to anti-trust, corporate governance, patents, and labor standards. We must run full employment economies so there’s pressure on the private sector to create jobs and raise wages. We must raise worker relative to corporate power. And we must recognize that even at full employment, markets still won’t solve the problems of poverty, racial discrimination, and unequal opportunity, thus requiring a progressive tax and transfer system. The WFTRA offers what looks to me like a timely, politically viable answer to that last part. Good changes: I continue to recover from the brain hemorrhage I sustained on March 23. Today’s my first meds-free day and I’ve been blessedly headache free. Thanks again for the outpouring of support–it’s been really uplifting. Neutral Changes: As I slowly rev up Ye Olde Analysis Shoppe, I found the figure below (by GS fiscal analyst Alec Phillips) to be worth a close look. It underscores a point that even seasoned budget analysts sometimes miss: the role of fiscal impulse. One of the more important policy-driven determinants of near-term US growth is under debate right now: setting discretionary spending levels for 2020/21. 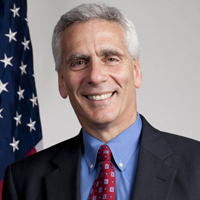 Because of 2011 legislation that set caps for such spending, avoiding a sharp drop requires Congress to pass a bill approving spending above the caps. They’ve done so numerous times before and, while there’s a lot of squabbling going on about this both within and between the parties, it’s likely they’ll bust the caps again. 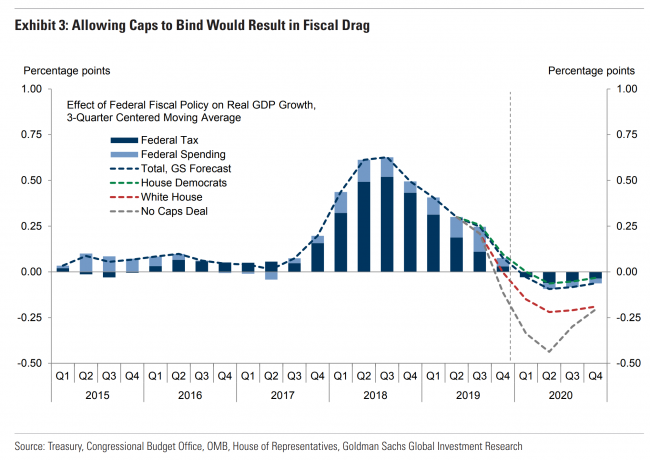 The point I wanted to underscore here is even were Congress to agree to keep the levels of discretionary spending stable over the next few years, the impact will be a fading of fiscal stimulus on real GDP growth, as the lines at the end of the figure below reveal. That’s because when it comes to fiscal impulse, it’s not the level that matters. It’s the change. The last deal–the one that determined spending in 2018/19–went both well above the caps but, more important from an impulse perspective, went well above prior agreements. As far as I can suss out about what’s on the table in terms of the next round of spending, we’re unlikely to see numbers higher than the 18/19 deal (around $300 bill above the caps). Thus, Phillip’s projection of the fiscal impulse going forward under various scenarios if flat next year. Roughly speaking, that’s one reason to expect 2020 growth to be closer to 2 percent than 3 percent. 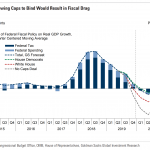 I don’t think the negative impulse forecasts from the WH or sequestration (“no caps deal”) are likely. And the House D’s line may get nudged up a bit based on proposals by the Progressive Caucus. But the larger point is that when you read analyses suggesting that these spending levels won’t drop, that doesn’t mean their impact on growth won’t drop. In fact, it will, as positive fiscal impulse downshifts to neutral. As some of you know, on March 23 I had a brain hemorrhage, technically known as a subarachnoid hemorrhage. This is a very serious condition, often fatal or disabling. But I appear to have been very lucky. After spending nine days in the ICU at Fairfax Hospital, I was discharged and am now recovering at home. The recovery period is likely to take quite a while, with good days and bad days. It could be a matter of months before I’m back to some version of my pre-hemorrhage self. I’ve benefited immensely from a tremendous outpouring of love and support from family, friends and colleagues, for which I am enormously grateful. I’ve also benefited from excellent medical care. I’m not sure when I’ll be posting or writing about the economy, but I plan to do so as soon as I am able. Like everyone else who knew him, I’m in shock and despair over news of the death of the economist Alan Krueger. Alan was the best kind of colleague: always inquisitive, incredibly rigorous about what constituted facts and evidence in economics, and willing and able to talk about his work in ways that made sense to anyone who would listen. I admired everything about Alan, but a few things stand out. He taught us a lot about creativity. Like the rest of us, he crunched numbers that were available from the usual sources. But he didn’t stop there. He believed that if you want to know the answer to something, sometimes you have to go out and get the data yourself, something very few economists do. I can’t be the only one who’s been in meetings with Alan, scratching our heads about some policy outcome, only to have him show up at the next meeting with a survey he somehow fielded with the answer to the question. It was this creativity that led to his path-breaking, minimum-wage work with David Card. Their book, Myth and Measurement, stands as one of the most muscular treatises not just on the facts of minimum wages–a national debate, btw, that Alan and David totally altered, to the benefit of millions of low-wage workers and their families (and how many of us can say that?…). The book is a shining example, one I’ve tried to emulate my own work, of how to test an economic assumption that everyone believes, but is wrong. With his brain power, he could have been high-handed and haughty, but he was anything but. To the contrary, he went out of his way to be a kind and empathetic friend. Once, when we worked together in the Obama administration, a prominent Democrat publicly distanced himself from some something I’d written. Before I’d even heard about it, I got a sympathetic note from Alan reminding me that politics is one thing, but we don’t throw our friends under the bus (his words, which I remember to this day). I simply can’t believe he’s not there for me to shoot an email off to, asking him some gnarly question that he typically answered for me in a clarifying sentence that completely unwound my confusion. Then, with that out of the way, we’d gossip a bit. A terribly sad day…a huge loss. All any of us can take solace in is how lucky we are to have known him.